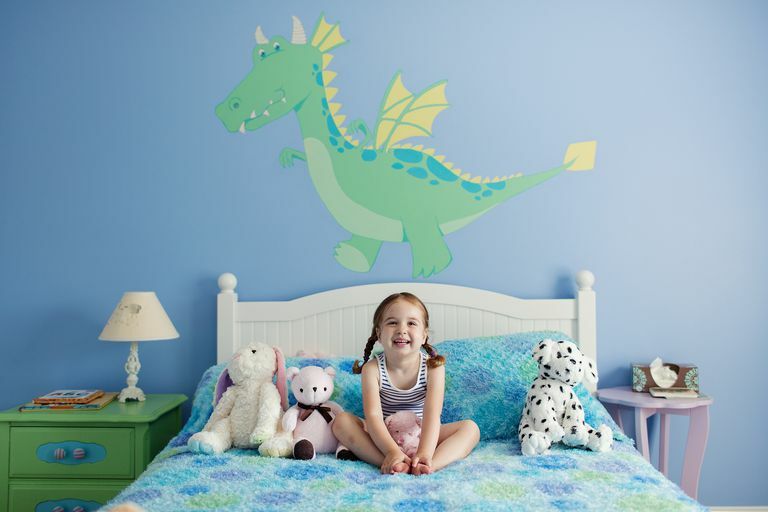 Thinking about redecorating your preschooler's room? What about a new paint job? Before you start slathering Elmo red paint on the wall, you might want to take a look at some research about the psychology of color from the Paint Quality Institute. Blue, which often ranks at the top of surveys exploring "favorite" colors, has been shown to slow pulse rate and lower body temperature. The implications for interior painting: Blue is a terrific color choice for bedrooms, but less so for dining rooms, according to Zimmer. Green, also one of the most popular colors, is a little more versatile. While it, too, has a soothing effect, it also represents renewal, youth, and vigor. Says Zimmer: "Because it is calming, green paint is a good color choice for bedrooms, and since it's the color of many appetizing fruits and vegetables, it can work in dining rooms, too." There's no equivocation with red. It bespeaks energy and excitement, actually raising the blood pressure and making the heart beat faster. Because red is associated with desire and passion, it's a perfect paint color for dining rooms and adult bedrooms, says Zimmer, but wrong for children's rooms. Yet, ironically, pink – a very light tint of red – is one of the most calming colors and is a fine choice for a baby's room, she says. Yellow is a great interior paint color. Like sunshine, it imparts happiness, hope, and optimism. Studies have shown that the brain actually releases more serotonin when the eye takes in yellow, creating positive psychological vibes. According to Zimmer, yellow can even stir our creative juices. What better color to use in a master bath or dinette to get your day off on the right foot? Orange is a happy color, too. More attention-getting than yellow, orange has an energy and warmth to it. Muddy shades are useful in many parts of the home, but vivid tones may appear raw and flamboyant. Zimmer's advice: "Orange is clearly not the color of calm, so it's best to bypass it when painting a bedroom or any other area where you want to relax." Purple is a tricky paint color wherever it's used, but it is the overwhelming favorite of adolescent girls, according to Zimmer. She suggests that you reserve use of this color for your daughter's room to create a win-win situation: "Odds are, she'll love it, and you can take comfort in purple's proven ability to stimulate brain activity," she says. As for black and white? Zimmer says, best to leave black as an accent as too much can be depressing, while white is not only peaceful, it can make a room appear bigger. Still, the bottom line is to choose what makes you and your little one happy. "No one will spend more time in your home than you will," says Zimmer, "so it's important to paint with those colors that are personal favorites. Choose colors that you love, and you won't go wrong!"